My Alexa app helps you book home showings, sell your house or find the estimated market value of a house. Selling in the next 90 days? Have an Amazon Echo? Download my Amazon Alexa app for your Real Estate needs. As an agent who's an expert in this local area, I bring a wealth of knowledge and expertise about buying and selling real estate here. It's not the same everywhere, so you need someone you can trust for up-to-date information. Here are some of the things I can do for you. You need some who knows the area inside and out. I can work for you to find the right home at the right price, including all of the neighborhood amenities that matter. When it's time to move, you need someone who will advertise your home, show prospective buyers, negotiate the purchase contract, arrange financing, oversee inspections, handle all the necessary paperwork and supervise the closing. I can take care of everything you need, from start to close. 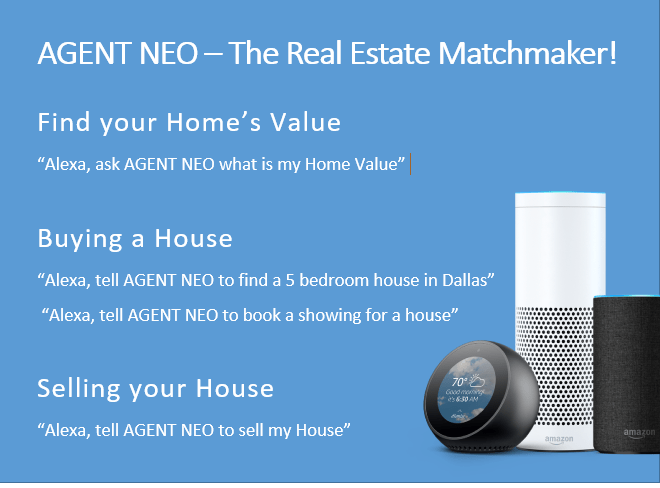 We build Voice Technology Products for Real Estate. 2017 © Agent NEO. ALL Rights Reserved.